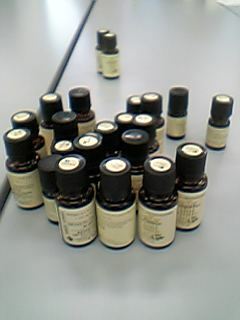 I'm a teacher of "Aromatherapy" having an aromatherapy school regularly . I got a qualification of "Adviser" from "Association of Japanese Aroma environment authorization. When I got this qualification,I was taken care of by Mrs O appearing in "Aromatherapy treatment". I have been holding my class in various places several times a month. Gyoda city in Saitama is the longest continuing place where I have my class. "I want to "hold an aroma class, do you know whether there are any people who are interested in Aromatherapy ? " She helped me willingly and called her friends as participants. That is why,I have been to Gyoda for 1 year and half, since the first time. On this occasion, I wanna tell her. "Thanks for your help for me." But she talked me that recently,she hasn't turned on her PC entirely"
A class is held once a month. About 10 participate every time. Participants are her PTA friends in the school where N's daughter and son go to. Mrs N told me "To tell the truth, I want to call more a lot, but I guess a lunchtime will be troubled with deciding a place to go together". . . and she laughed. As a matter of fact,a lunchtime after the class is always very fun. 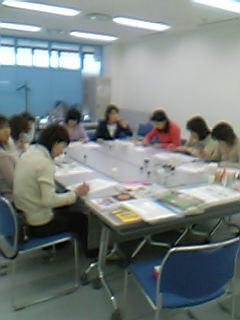 At this class, I teach how to make the original goods with some essencial oil every time. The goods in this time was "foaming bath essence." ↑Please imagine that is like "the バ ○ of 花○". Mix powder materials well first ,and add essential oil and glycerin (humidity retention liquid). And harden it in saran wrap like a "tyakin-zusi" ーwhat is Japanese traditional food formed by wrapping and twisting with fried egg into a bag shape last. When I made it at home, I guessed that quantity of glycerin did not seem to be enough and I added much slightly. I was not able to predict what this addition caused at this time! Because I used it immediately in a bath after making it. One participant added glycerin much since she seemed to have been troubled with mixing materials a bit. When we finished class and begun to clear it up, only her bath bath essense was expanding!, and seemed to come to explode! ! ! ! I realized it would be dangerous! sodium bicarbonate + citric acid + water. . . . . . It is natural to expand! It is natural to explode! I had no idea what I was suppose to do!! I and other participants said "well..you might add much glycerin ...a bit.you need to use it immediately." I worried about her, and handed a plastic bag to be able to take it home safely . Afterward,we went to the lunch that I planned for other article on the next time, and I left the restaurant early. I recieved a e-mail from Mrs N .
"Yacchan,(a note：she call me this name) A terrible happening occured after you left! Bath essense of all the members were becoming to conditions that seemed to explode! ! ! I'll try to remake it again.